Univision anchor Jorge Ramos asks Republican presidential candidate Donald Trump a question about his immigration proposal during a news conference in Dubuque, Iowa. Listen here to The Florida Roundup: Preparations for Tropical Storm Erika, Jeb Bush has Florida's "hurricane governor" and what it means to be a "Hispanic" voter. Are you a Hispanic voter? Which presidential candidate would you like to hear from and what Florida issues would you want him/her to address? The candidate with the top votes will be invited for an interview on WLRN 91.3 FM's The Sunshine Economy. 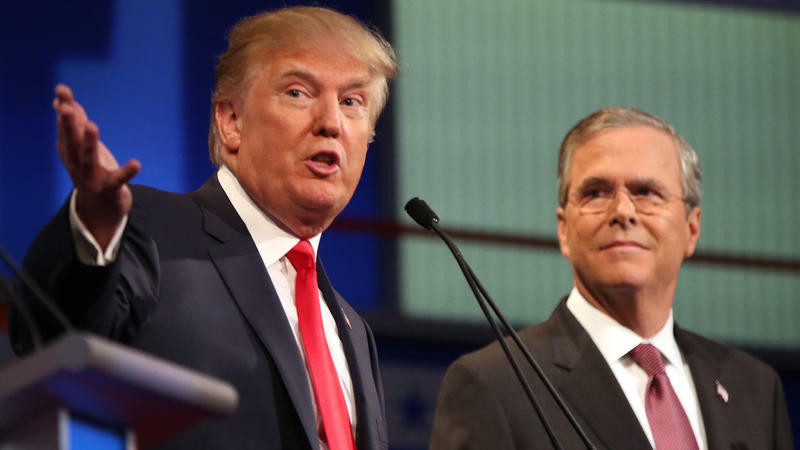 Today on the Florida Roundup, Jeb Bush officially enters the race for the White House. How will he compete with Marco Rubio for the Hispanic vote in Florida? Protestors in Little Haiti called on the president to take action on a Dominican Republic court ruling which may lead to mass deportation of Haitians living there. Let’s get to the actual question — and what Jorge Ramos tried to ask Donald Trump last night: How does he plan to deport more than 11 million undocumented immigrants, as he has often repeated? It’s a critical question for all Americans and, especially, Ramos’ audience. For Ramos, the popular anchor for Fusion and for Univision, the biggest Spanish-language network in the US, there is no room to see the Republican Party presidential front-runner in the abstract or as a source of political humor.